I had learned about HumanMOOC from Adam Croom at Twitter last week and I had signed up, thinking it was starting December 7, and then by accident saw a Hangout announcement at Google+ already today, Saturday (Dec. 5)... it was a quick one, just 30 minutes, with George Siemens (Hangout link). I listened to the whole thing (which is a good sign) and it was interesting of course, but it also left me wondering: why would I want to do this course exactly? The item in the course description that had pulled me in was something about making things we can use in our classes or something to that effect, but the impression I got from the Hangout today was that this was going to be discussion. And you know, I already discuss this stuff all the time already in my networks, and I'm not sure I want/need more discussion. So, we'll see. I'll poke around at the site and figure out just what it is that IS happening on December 7. If we are going to be creating and making things (and I have a pretty broad definition of what "things" might mean! ), and then sharing the things we make, that would be GREAT, and I'll definitely stick around for the ride. But if it's just reading and discussion, I'm already pretty maxed out on reading and discussion. 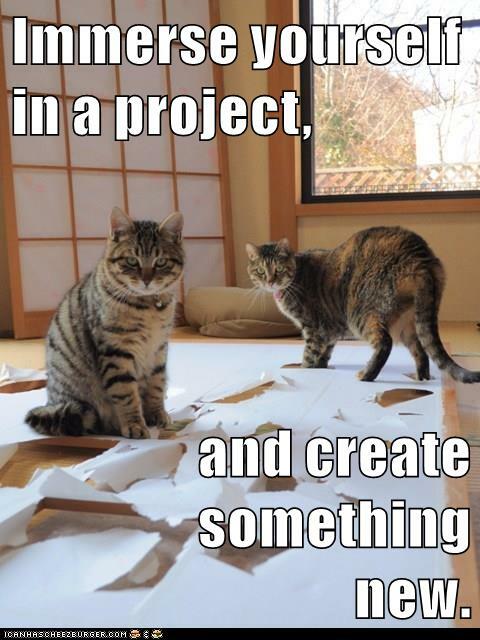 Immerse yourself in a project, and create something new.